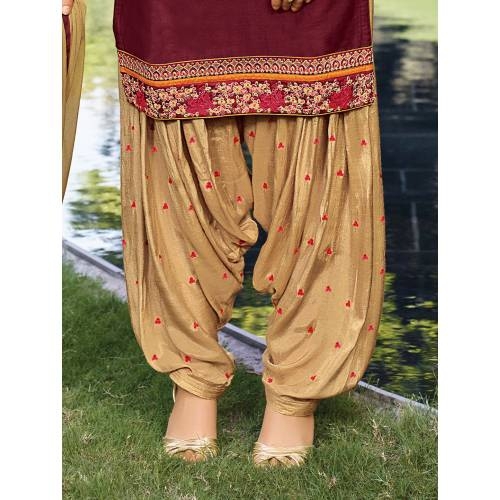 Appear stunningly beautiful in such a Maroon and Beige cotton Patiala Punjabi suit for women. The ethnic embroidered Salwar suit is beautifully designed by embroidered work with Â¾ sleeves adds a sign of attractiveness to your style statement with your look. This Embroidery Patiala salwar suit made of Pure Cotton top and Cotton Blend bottom with Chiffon dupatta. Since the patiala salwar is unstitched dress material ,so customer can stitch as per requirement & bottom with pleats style. It is a very comfortable outfit to wear in all seasons. Maximum possible bust size: 42 inches .